Do you constantly carry around pain in your shoulders that you just can’t seem to shake? After a long day, do you come back home wishing you could get a massage as soon as possible? With Health and Body Store, you can find soothing and affordable products that will reduce shoulder pain and improve mental and physical health. 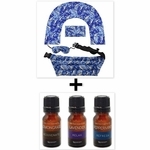 We offer a variety of aromatherapy packs online. 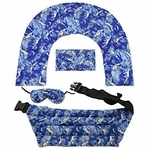 In addition to our shoulder wraps, we carry aromatherapy booties, basic packs, and eye masks. Aromatherapy packs can be used on the neck, back, shoulders, legs, arms, and any part of the body that is sore or aching. You’ll be able to take in the calming scents of these packs and get rid of pain while simultaneously feeling pampered. Aromatherapy is the art of using different spices and herbs to promote relaxation, healing, and preventative health care. When you use an aromatherapy wrap or pack, you both inhale and absorb the aromas that come from the herbs. The aromas from the herbs trigger a nerve message to the brain, causing the brain to release chemical pain relievers and experience feelings of well being. After buying aromatherapy packs online, you can put them in the microwave to release their moist heat. Because of this heat, the essence of the herbs can be absorbed through your skin, muscles, and joints to relieve pain. You can also freeze them to cool down a part of your body that is in pain. Freezing the pack reduces swelling, muscle spasms, and bruising. Imagine coming home from work after a long day. All you want to do is lay down, but your body is in too much pain to get comfortable. When you buy aromatherapy wraps, you can trust that you will always have a way to relax and get rid of that pain. Our aromatherapy packs available online allow you to lay down, read a nice book or watch some TV, and feel pampered all at the same time. Our aromatherapy packs for sale are available in a combination of scents that will please your mind, your body, and your senses. All of the scents that come from our herbs are natural and calming to relieve pain and promote mental wellness and stress relief. When you buy an aromatherapy neck wrap online, you’re signing up for pain relief, calming of your senses, and a massaging sensation. When you purchase our Nature’s Approach® herbal packs online, you will be able to use their hot and cold features for all of these purposes, all while inhaling their soothing scents. To experience the calming health benefits of these wraps, we have many aromatherapy neck wraps available online for purchase. Also, if you would like to buy aromatherapy essential oils to take in their calming scents and apply them to your skin, we carry them and multiple other aromatherapy and essential oil options. At Health and Body Store, our priority is to promote mental and physical wellness through our calming and therapeutic products. 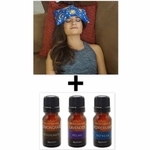 Browse our online site to view the heating pads, aromatherapy packs, essential oils, and diffusers to reduce muscle pain and relieve stress.